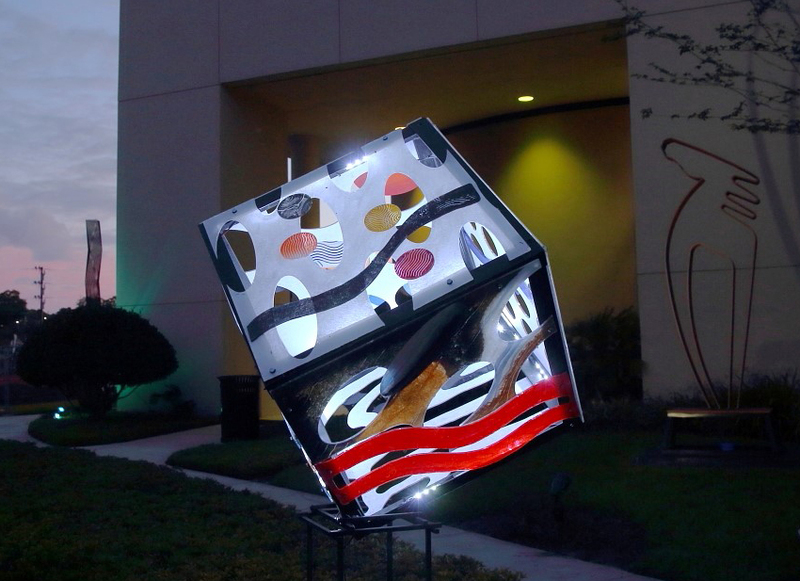 October 26, 2019 - 6:00 - 9:00 p.m., Lake Concord Park will be on full display with an evening of iLLuminArt – Spotlight on Sculpture. From large-scale sculpture to dazzling temporary light installations, there is something for everyone at this celebration of sculpture! A beautiful garden environment is the canvas for artists using sustainable LED lighting, digital projections, art-light installations, and sculpture lighting to create unique artistic expressions and dialogue. In addition to the temporary installations, Spotlight on Sculpture also brought new light on existing artwork in Lake Concord Park by Dana Callan, Mindy Colton, Marcos Cruz, David Cumbie, Johann Eyfells, Arlene Friberg-Vivaldi, Noelio Gonzalez, Jacob Harmeling, Jacquelyn Harmeling, Patricia Muse, Jene Omens, Steve Pi, Bill Platt, Aurora Rincon, Milos Saric, Chris Scala, and Duke Snyder, as well as unveil this year's new additions to the sculpture garden!